Move over face packs! Because the latest trend of sheet masks has replaced them for good. Do you envy Korean beauty’s flawless skin? Yes, everyone in the world does! Would you like to know the secret behind their dewy skin? It’s the sheet mask! The single sheet mask has countless of benefits for your skin and better product absorption than the conventional face packs. But having a look at the sheet masks online, it gives us a mini-heartbreak. Isn’t it? Buying a pack of sheet masks for a month would be like burning a hole in your wallet. Also read: Confetti Eyeliner Is the New Trend in Town! But here we are with some simple yet real-world DIY sheet mask ideas. You would like to bid farewell to the drippy and messy face packs once you’ll ace at it. Many international celebrities like Lady Gaga, Sophie Turner, Rita Ora, etc have popularised sheet masks and now we can’t stop thinking about having them! many celebs have shared their phantom faced (With the sheet mask on) selfies on their Instagram accounts. 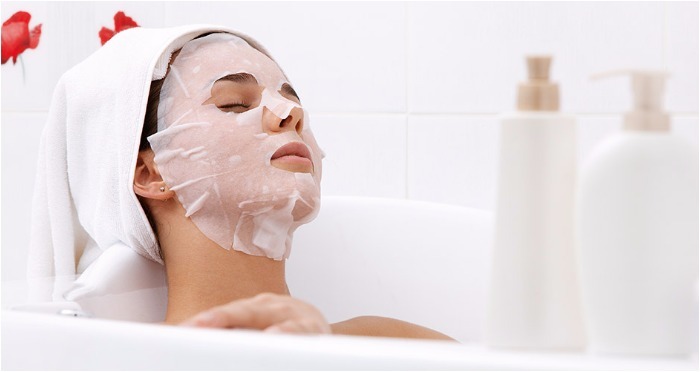 What Really Are Sheet Masks? Sheet masks are pre-packed face masks with the holes for eyes, mouth, and nose. The sheet is pre-soaked in the solution which leaves your skin rejuvenated and radiant in no time. You just have to place the mask over your cleansed face. The best part is, they are easy to carry and they won’t take much room in your luggage. Plus, they are spill-proof! The solution they are soaked in is usually packed with some essential vitamins and antioxidants to target specific skin problems like dullness, ageing, oily skin, pimples, blemishes and so on. The solution stays in contact with your skin for a longer time which confirms the effectiveness of these sheet masks. How to Make Sheet Masks at Home? Making sheet masks at home is easy and fun. They are meant for one-time use, so you can prepare many at a time for future use. Soak the cotton pad in any essential oil or the one targeting your skin concern. Cotton pads are easily available in the market. Stretch the cotton pad on your face and put it on for 15-20 mins. you can add in some distilled water to dilute it. Using more than one essential oils will be added goodness. Sensitive Skin: Aloe vera gel, rose hip oil or chamomile tea. Oily and Acne-Prone Skin: Witch hazel extracts, tea tree oil or green tea. What are we waiting for? Let’s do this and get a glowing face each time at your convenience. Next : Fawad Khan leaves India to go back to Pakistan. Is it because of the growing unrest in India?